Wisdom of Life. : Why Mr Singh is stronger? Are you aware that Punjabi is the most minority race in Malaysia. I think they are less than 1% of the population. And yet they stand tall because with their sharp pointed turban and thick beard, any one Singh could be seen from afar. Funny isn't it? Do you have many closed or best Punjabi friends? Even if you have, there would not be many of them for you to know. However I am proud to say, I do have many Singh and Kaur as my brothers and sisters. 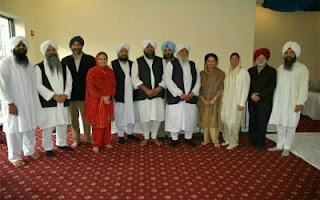 I have more than 50 Punjabi friends and some of them are considered my best buddies. Their race might be small in number but they are a special class above the rest of us. Have you seen any Punjabi beggar who begs? Not me! Have you heard or seen any Punjabi who is so poor to ask for charity? Never! Because they are very united within themselves. Any Singh who wears a turban and sees another turban Singh would greet each other from a distance. Even though they might not know each other in person. This is the manner and culture for all Singhs. Most Punjabi of today are professionals or doing their own business or corporate figures. I considered them to be successful. Most of my Punjabi friends are doctors, scientists, engineers, architects, lawyers, nurses or self employed. These are the third generation Punjabi of Malaysia. For what they are today, I think they have to be thankful to their grand fathers who first step foot in this country, which was Malaya then. Those who arrived from India at that time, brought nothing with them but just their bare hands and legs to work. The other races came as well but non could work harder and sacrificed more than the Big Singh. Most people could work one or two jobs a time. Right? Not the first generation Singh in Malaya because they almost had four different jobs or income a time. Believe me! The father Singh would be working during the day with a company, drawing a fixed salary. Meanwhile, his family would be rearing cows to produce milk everyday. They supplied fresh cow's milk right to your home at a reasonable price. In the night, when all would be going home to spend time with the family, the father Singh would be reporting to the Chartered Bank for night duty. Can you guys remember the advertisement, "Singh, the friendly jaga from Chartered bank?" They slept on bed made with rope when we slept on bed made with cotton. One more before I forget. The family also had a private unlicensed money lending business. So the sacrifices and hard work from father Singh and family, gave them an edge to earn the amount of income, when most other races were not prepared to do. The Singh also had foresight for their growing children. They made sure the children were given the best for education. Those days, most would be contented with a Senior Cambridge certificate or GCE level qualification to pursuit for employment. Not the Singh, because they could afford to send their children abroad for university courses which most could not dream of. Today the Punjabi has gone far and progressed well in life. They are no longer termed as jaga. They don't have to supply milk to your home. They don't sleep on rope bed by the shop corridor. Instead of lending money, they give charity to the needed one. Small in number but successful in size. The next time you meet a Singh or a Kaur, please rub shoulder with them and you would be learning something great that your parents might have missed out. Just like me having to learn and inspire by these friends; Peritam, Sidhu, Manjit, Harcharan, Jeswant, Jagdish, Dhaliwal, Hanjeet, Nirmal, Dharamvir, Gurdip, Karamjeet, Joginder, Ranjit and others. Thank you my brothers Singh and my Sisters Kaur, who had one way or another thought me to live right in life; "Life is largely a matter of expectation. If you want to succeed, you must expect to succeed. So if you begin with some wild expectations, you'll succeed beyond your wildest expectation. When you expect things to happen, strangely enough, they do happen. Expectation energizes your goals and give them momentum. When you believe something good can happen, it will happen. The dreams you believe it comes to be. Your life responds to your outlook."